She partially loves him, but their love is the epitome of complicated. Instead, Raoul (played by Chicago native Ben Jacoby) is the guy she’s supposed to marry and take home to mommy. The Phantom – in a bit of a “Beauty and the Beast”-like story – falls victim to his biggest downfall: choosing to become the monster the world has been to him instead of embracing forgiveness. He could have become a Beethoven or Bach if only he’d have chosen another way. “Angel of Music”: Julia Udine as Christine Daaé and Cooper Grodin as The Phantom in “The Phantom of the Opera”. “The Phantom of the Opera,” which is hailed as the most successful musical of all time, returns to Chicago at the Cadillac Palace Theatre with newly revamped staging, dazzling scenic design and those unforgettable songs you’ve come to know and love. The show is playing now in Chicago with a cast and orchestra of 52 – making it one of the largest productions on tour in North America – through March 2, 2014.
Cooper Grodin stars as The Phantom. As a body of work, this is an epic, Broadway-caliber production of Andrew Lloyd Webber’s masterpiece from producer Cameron Mackintosh and The Really Useful Group. It is directed by Laurence Connor, who is directing the 25th-anniversary production of “Les Misérables” coming to Broadway in March 2014 and has helmed “Jesus Christ Superstar”. 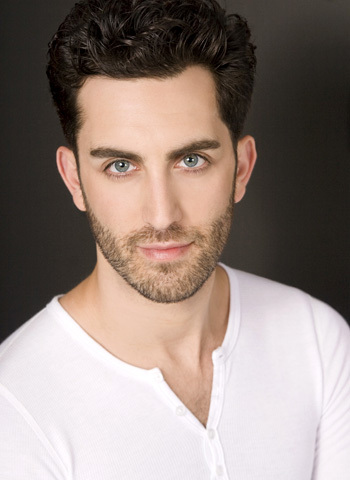 Interestingly, Cooper Grodin from Manhattan has stepped into the title role as The Phantom for Mark Campbell, who is no longer touring with the production due to personal reasons. Grodin has been seen in the national tour of “Les Misérables” and has a debut original album titled “It’s The Little Things”. He is a tour de force who embodies the two-faced creature with all the love, tenderness, hatred, passion and anger we’ve come to expect. The role of Christine, who was originated by Sarah Brightman, has been passed off to Julia Udine. Brightman, by the way, was married to Andrew Lloyd Weber from 1984 to 1990, which is when the show got its initial legs. Udine makes her touring debut with the production after appearing in “West Side Story” (Maria), TV’s “Law & Order SVU” and TV’s “All My Children”. An ingénue truly is the word to describe her in the role and she hits musical notes most humans couldn’t dream of. Chicago’s Ben Jacoby disappoints as Raoul. Raoul is supposed to be the guy Christine loves and chooses as a wiser and more stable choice than The Phantom, but here he’s played too angrily and lovelessly by Jacoby. You don’t feel his chemistry with Christine and you root more for her to stay with The Phantom. Ben’s dad, by the way (Mark Jacoby), has played The Phantom. 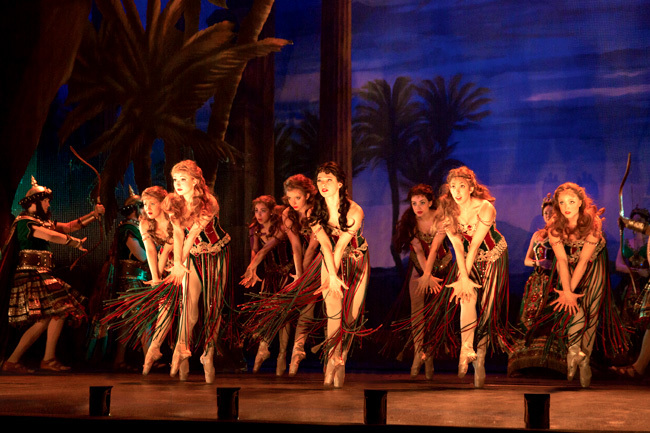 “Masquerade”: The company performs “Masquerade” in “The Phantom of the Opera”. 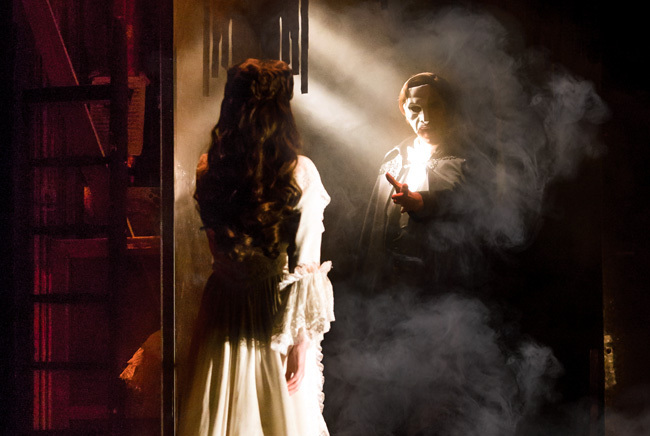 While Raoul’s connection with Christine is tepid at best, The Phantom’s fire with Christine is like burning embers that sometimes get blown on and set ablaze and other times acts merely as a spark in danger of dying out. To have achieved the nail in their coffin of chemistry, they needed at least one visceral and animalistic scene with their bodies pressed together and no singing whatsoever. Grodin and Udine have played their roles together in this tour for such a short period of time that hopefully their stage chemistry will learn to burn brighter as the tour presses on. I don’t usually have to look for or think about the star of a show. Sometimes it’s a lead, oftentimes it’s a supporting character who the production didn’t even intend and even other times it’s not a person at all but an environment, the lightning or the sound. Here it’s neither The Phantom nor Christine nor Raoul. If you could lump The Phantom with Christine and envision a new character who is their combination, that’s your star. It is their love and hate – their push and pull – that is the production’s most intoxicating feature. As for the story as a whole, those who don’t know it or have never seen any iteration of “The Phantom of the Opera” – either on stage or a film – may have a hard time following it. “The Music of the Night”: Cooper Grodin and Julia Udine in “The Phantom of the Opera”. Because it’s staged entirely in song and the musical style is opera, sometimes the singing – while always on note – sounds like beautiful and grand music but you can’t always translate the words in your head to effectively follow the plot. Story comprehension also tended to be distracted by expensive microphones that produced shrill “s” sounds for many of the performers. Based on the classic novel “Le Fantôme de L’Opéra” by Gaston Leroux, the show tells the story of a masked figure who lurks beneath the catacombs of the Paris Opera House. He exercises a reign of terror over all who inhabit it and falls (literally) madly in love with the innocent young soprano Christine. The Phantom devotes himself to creating a new star by nurturing her extraordinary talents and by employing all of the malevolent methods at his command. While including some spoken dialogue wouldn’t be true to the script, the musical arrangements need to allow important plot points to more obviously shine through. Most people will need to talk to a few fellow theatre patrons to piecemeal together the course of its events. “Hannibal”: The Corps de Ballet in “Hannibal” (choreography by Scott Ambler) in “The Phantom of the Opera”. When you’re not trying too hard to understand what’s happening and why, the powerfully evocative songs, intricate staging, mysteriously appropriate lighting and pyrotechnics you can see and even feel from afar all do an effectively perfect job of capturing this show’s epic splendor. The chandelier is over the audience instead of on stage. When it falls at the end of the first act before the lights fade to black, a fun and refreshingly interesting choice is made to spew shattered “theatre crystal” into the hands and hair of the audience. It glistens like the real thing, but feels like a safe jelly material. There are currently six productions of “The Phantom of the Opera” around the world: the flagship London production (27 years and counting), New York (approaching 26 years), Budapest (Hungary), Hamburg (Germany), the Asian Pacific tour and this all-new North American tour. Since its debut, the show has grossed more than $5.6 billion worldwide with more than 65,000 performances that have been seen by 130 million people in 29 countries and 150 cities in 13 languages. Tickets for “The Phantom of the Opera” at the Cadillac Palace Theatre (151 W. Randolph in downtown Chicago) range from $23 to $115 with a select number of premium seats available for most performances. It is currently playing through March 2, 2014 every day of the week except for Monday. Tickets are available at Broadway in Chicago. Discounted tickets are available at Goldstar. The show has a running time of 2 hours and 30 minutes with one intermission. 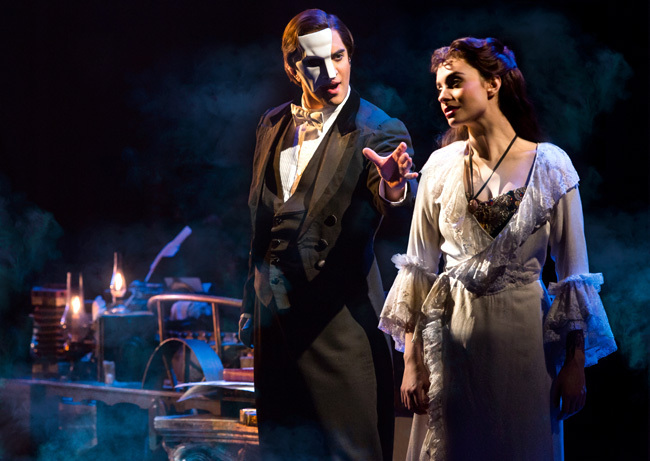 Cooper Grodin stars as The Phantom with Julia Udine as Christine Daaé and Ben Jacoby as Raoul.